Chrysostom was not John’s last name, not really. It is Greek for “golden-mouthed.” That is what first his parishioners called him, and soon so did everyone else. St. John Chrysostom was a dominant force in the fourth-century Christian Church. Born in Antioch around 3 47 AD, John was instructed in the Christian faith by his pious mother, Anthusa. After serving in a number of Christian offices, including acolyte and lector, John was ordained a presbyter and given preaching responsibilities. His simple but direct messages found an audience well beyond his hometown. In 395 AD, John Chrysostom was made patriarch of Constantinople. His determination to reform the church court, and city brought him into conflict with established authorities. Eventually he was exiled from his adopted city. 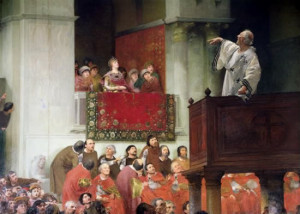 Although removed from his parishes and people, he continued writing and preaching until the time of his death in 407 AD. It is reported that his final words were “Glory be to God for all things! Amen.” His life can remind us that following Jesus does not automatically mean an easy or prosperous life, even in a “Christian” setting. Following Christ has a price; a price believers are willing to pay. The best way I know how to let you know what his preaching and writing were like is to give you a sample. “He gave Himself a ransom,” he said, how then was He delivered up by the Father? Because it was of His goodness. And what does “ransom” mean? God was about to punish them, but He did not do it. They were about to perish, but in their stead He gave His own Son and sent us as heralds to proclaim the cross. These things are sufficient to attract all and to demonstrate the love of Christ. So truly, so inexpressibly great are the benefits that God has bestowed upon us. He sacrificed Himself for His enemies, who hated and rejected Him. What no one would do for friends, for brothers, for children, that the Lord has done for His servants; a Lord not Himself such a one as His servants, but God for men, for men not deserving. For had they been deserving, had they done His pleasure, it would have been less wonderful. But that He died for such ungrateful, such obstinate creatures, this t is which strikes every mind with amazement. For what men would not do for their fellow men, that has God done for us! Prayer: O God, You gave to Your servant John Chrysostom grace to proclaim the Gospel with eloquence and power. As bishop of the great congregations of Antioch and Constantinople, he fearlessly bore reproach for the honor of Your name. Mercifully grant to all bishops and pastors such excellence in preaching and fidelity in ministering Your Word that Your people shall be partakers of the divine nature; through Jesus Christ, our Lord, who lives and reigns with You and the Holy Spirit, one God, now and forever. Amen.